It’s the month of the Irish, so let’s celebrate—not with green beer, but with that other thing Ireland is famous for: its taters. 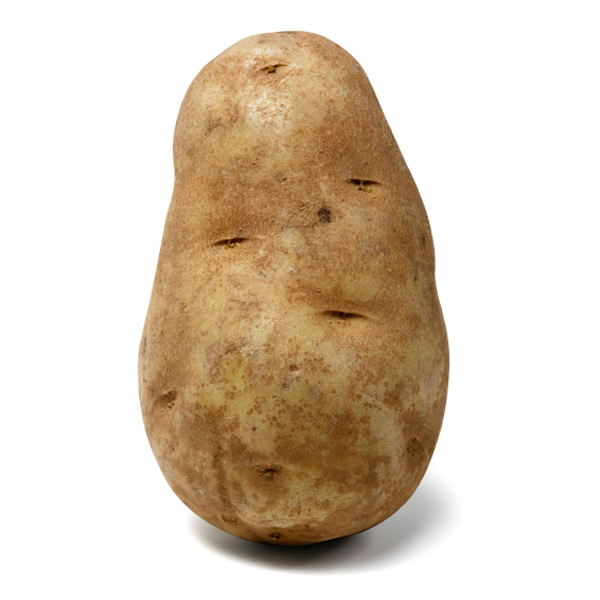 Taters are originally a western hemisphere plant, so how did the Irish end up with the credit? Those conquistadors took taters back to Spain, and they were first cultivated in Europe on the Basque coast. Then Sir Walter Raleigh introduced them to Ireland, and it was from there that they caught on to the rest of Europe. Most of us have heard of the Idaho potato, and maybe the Russet and the red, but did you have any notion that there are more than 4,000 varieties of potato? We don’t grow too many here, but in their native Peru, markets are full of more than 100 varieties of edible taters. Fascinatin’ history, but what about all that starch? It’s true that too many taters can have the same effect on blood sugar as too many cookies, but taters also come with a whole lot more goodness than cookies—especially if you can learn to love the skins. Taters are high in potassium, iron, vitamin C, B6 and fiber. Best of all, they are a great food for a single person on a budget. You can buy five pounds of taters for just a couple of dollars, and that will last for lunch for at least a couple of weeks. Keep it fresh with unique add-ons each time, like the ones below. Smaller taters make a great between meal snack too. I’m gonna assume you know yur way around taters well enough to put butter, salt and pepper on a baked potato. Other old faithful tater toppins are chives, sour cream, cheddar cheese, broccoli and bacon bits. All these are classics, and there are just dozens of other excitin’ ways to dress up a tater. BuzzFeed has 23 ideas such as the samosa-inspired recipe with peas, curry and mustard seed or the beef shoulder and black bean chili potato. But, who’re we kiddin’? Who’s got mustard seeds? Who’s gonna whip up a batch of beef shoulder chili when what you’re goin’ for is a quick meal? My idea is to keep it quick, cheap, hassle-free and healthy. Ever’ one of these concoctions goes on top of a tater you’ve washed, stuck a few times with a fork, nuked for six minutes, or until you can easily stick a fork in it. Careful, now, takin’ it out of the microwave and cutting it open length-wise. Add salt and pepper. A final note: taters baked in the oven are far superior, especially if you rub a little oil on the outside before you bake. So if you have the time, it’s worth the effort. Previous Is That Your Final Answer?